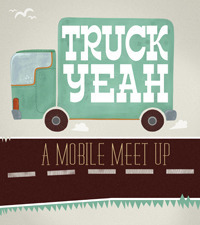 In partnership with Gawker Artists and Jalopnik, Art Cart NYC™ and Etta Place present Truck Yeah: A Mobile Meet Up. Truck Yeah is a free, cultural festival to be held on Sunday, October 2nd, 2011 at The Crown Victoria Bar in Williamsburg (60 S. 2nd Street, at Wythe). 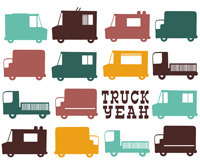 A group of 10 trucks, including Truck Farm, Rickshaw Dumpling Truck, Mud Truck, Coolhaus Ice Cream Sandwiches, and the Green Pirate Juice Truck, will convene to celebrate the increased mobility and changing landscape of New York City. Art Cart NYC™ will exhibit work by Amia Yokoyama and Kennedy Yanko, El Camino ARTRV will show an installation by Stephen Zerbe, and Gawker Artists will present a photo box project by Adam Courtney. In addition, Etta Place will present Resident Artists, the Lonely Goat Dance company will perform, and BangOn! NYC will play music throughout the day. Your contributions will enable us to fund all aspects of the festival, from truck rentals to permits, fees and promotional materials, art supplies, and installation costs. Over the course of the campaign we will feature each participant on all of our sites, and will send out dedicated newsletters. One of Gawker's sites, Jalopnik will dedicate a post to a different food truck each day of the week leading up to the event entitled "Street Meat Week." We are really excited to share the talents of Sarah Goodreau, Barbara Low, and Stephen Zerbe, and grateful to have their work offered as your rewards. PLEASE NOTE--We would like to encourage you to pick up your postcard, sticker, and Truck Yeah Bundle rewards AT the event. If you intend on doing this you do not need to pay the additional shipping cost. The collage by Stephen Zerbe and commission by Barbara Low will need to be shipped and cannot be picked up at the event. All of the above, and a Truck Yeah poster. 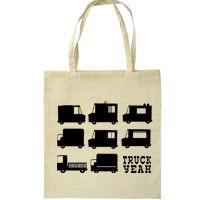 The Truck Yeah Bundle: All of the above sent to you in a truckin’ awesome custom tote bag. Our truckin’ awesome tote bag and a limited edition print of Sarah Goodreau’s Truck Yeah Grid. The Truck Yeah Bundle, and A VIP Tour through the event-meet the artists, snack on some dumplings, and schmooze with other VIP’s! All of the above, plus a unique collage by artist Stephen Zerbe. All of the above, plus a commissioned portrait painted by Barbara Low (details to be organized between backer and the artist).